My first reaction was: what is Gibbs’ phase rule? After conducting a little web research, speaking with a colleague in our chemistry department, and doing a little library work, I discovered that Gibbs’ phase rule is an extremely elegant formula that was discovered in 1870 by the chemist-physicist-mathematician Josiah Willard Gibbs. It is typically taught in a course on physical chemistry. Below I give a brief explanation of Gibbs’ phase rule, then I remind the readers what Euler’s formula is, and finally I try to answer the question of whether they are the same. At standard pressure and F, water is liquid, so . Thus, there are degrees of freedom. In particular, we can vary both the temperature and the pressure and the water remains liquid (this corresponds to a point in the interior of the region marked L). On the other hand, if that water is F and is kept at standard pressure, then it can coexist in both liquid and gas form, so . Thus, there is only degree of freedom. We can vary the temperature, but doing so would necessarily change the pressure. (Eg., as we heat the mixture, more liquid turns to gas and the pressure goes up.) This is illustrated by the curve dividing the regions labeled L and V.
Notice that it is possible for solid, liquid, and gas water to exist simultaneously in equilibrium. In this case , so there would be degrees of freedom. Such a point is called a triple point. (TP in the diagram above). Finally, observe that when there is one component, it is impossible for four phases to coexist in equilibrium, for that would imply that , which is impossible. When there is more than one component present, then the various components can be in several different phases simultaneously and we can use Gibbs’ phase rule to determine the number of degrees of freedom to remain in that equilibrium state. Euler’s polyhedron formula states that any polyhedron (such as the five platonic solids shown below) with vertices, edges, and faces satisfies . For example, the cube has 8 vertices, 12 edges, and 6 faces, and . Similarly, the dodecahedron (the polyhedron on the far right) has 20 vertices, 30 edges, and 12 faces, and . This formula has a long history and has been generalized in many directions. 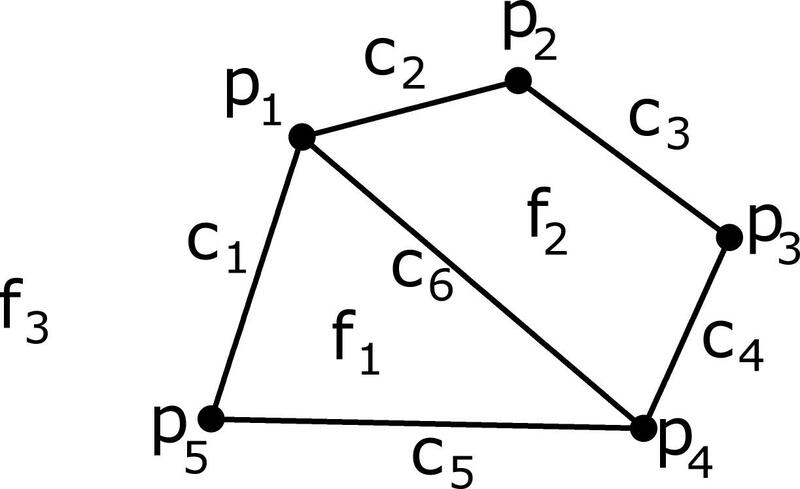 One generalization of Euler’s formula, and the one that will be useful to our discusssion, is to planar graphs. A graph is a collection of vertices and edges (as shown below). If a connected graph is drawn in the plane so that no two edges cross, then it divides the plane into faces. As with polyhedra, if there are vertices, edges, and faces (counting the unbounded exterior region as a face), then . For example, the graph on the left has 7 vertices, 11 edges, and 6 faces, and . The graph on the right has 7 vertices, 12 edges, and 7 faces, and . Are the two formulas equivalent? Are they the same formula in disguise? At first we may try to link these ideas to the phase diagrams; after all, they look geometric and the phase diagram for water looks like it has something resembling faces, edges, and vertices. However, if we start adding components and degrees of freedom, the phase diagrams be come n-dimensional. Thus the regions are no longer just vertices, edges, and faces. Moreover, some of these regions are unbounded, which can spell trouble for Euler’s formula. Finally, even in the phase diagram for the 1-component system given above, the faces, edges, and vertices do not correspond to particular phases, components, or degrees of freedom. (Rather, a point in the phase diagram corresponds to a specific choice of , , and .) So this is a dead end. If there is to be a connection, we would have to create a diagram like the one below. Each vertex is a specific phase, each edge is a specific component, and each face is a specific degree of freedom. However, each edge borders only two faces and has only two endpoints. This pair-wise relationship does not seem present in Gibbs’ phase rule. It would make sense if each component could only be present in two different phases and if each component was somehow paired up with two degrees of freedom. This is not the case (the triple point of water shown above is a counterexample). There is a more basic problem. In Euler’s formula, we need , , and . But in Gibbs’ phase rule it is possible for the number of degrees of freedom to be zero. It seems that there is no connection. I should mention that there are several scholarly articles addressing this question. I have only tracked down one of them—the 1990 article “Euler’s formula and phase rule,” (subscription required) by T. P. Radhakrishnan in the Journal of Mathematical Chemistry. This author came to the same conclusion I did. OK, so these two formulas are not equivalent, but they are the same formula. So we could use Euler’s formula as a means to remember Gibb’s phase rule—i.e., to create a pictorial mnemonic. Here’s my suggestion—I’ll call them Gibbs flowers. But, to make things more intuitive we’ll use the terms points, connectors, and faces so the letters match up. Suppose we know the number of components and the number of phases and we want to determine the number of degrees of freedom. 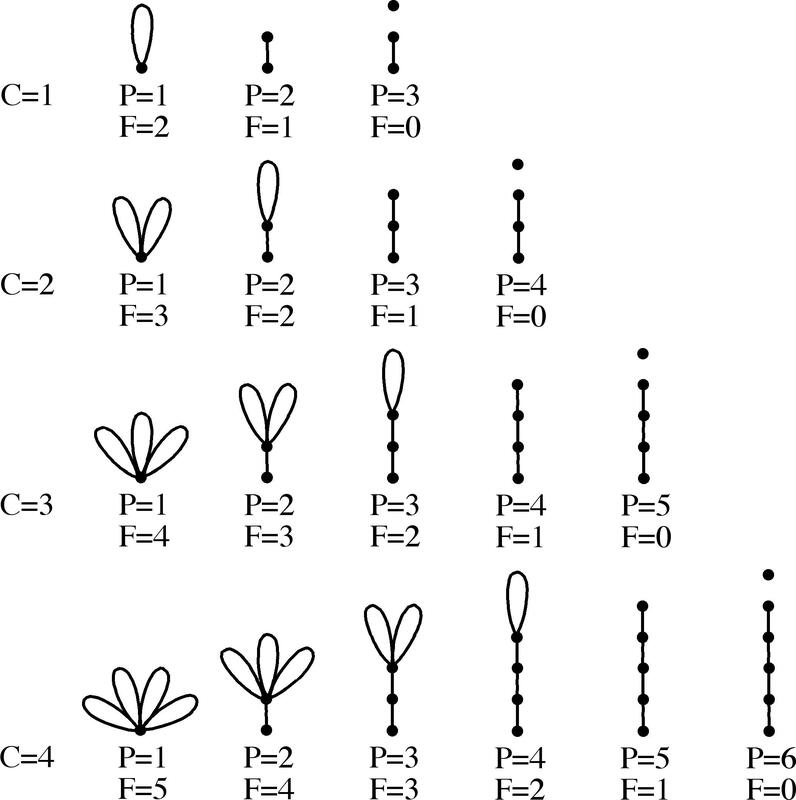 To find we draw a graph with points and connectors (that I call a Gibbs flower), then we count the number of faces. Begin by drawing points arranged vertically. Then draw connectors, starting at the bottom of the stem and making as many petals on the flower as necessary. The number of faces (including the unbounded face) is the number of degrees of freedom. The only instance in which this technique breaks down is when . Then we have a disconnected graph. In this case, we say, by convention, that . If anyone has any thoughts, ideas, corrections, suggestions, etc., please post them to the comments below. if they look the same, they are the same. its just not easy to see why, i do not see it either, but this is how science works.